We’re so in love with the co-co. Can’t you tell? Coconut oil seems to be everywhere these days. From the foods we eat to the products we out on our skin, we are loving it’s benefits and how it helps our bodies and skin. It’s also one of our favorite oils to use on our hair, especially coconut oil as a conditioner. 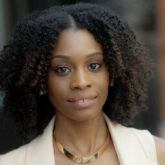 Today, we’re talking all about coconut oil conditioner and how to use it on your hair–whether it is straight from the bottle or infused in a formula that you can easily find in your favorite drugstore wash and care system. For a little background history on what coconut oil actually is and how it’s made, take a skip over to our coconut oil shampoo post. You should also know that coconut oil is one of the many oils that is able to penetrate hair which makes it such a great conditioner for hair. 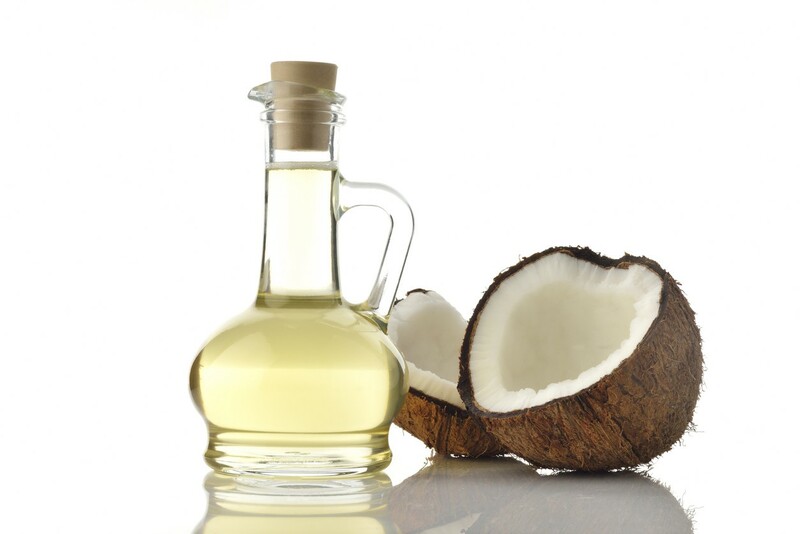 Instead of just sitting on top of your hair, coconut oil gets into the hair shaft and conditions from the inside out. You can opt for infused coconut oil conditioner or you can go for the real deal. While we are truly advocates for the real deal, the infused option is less messy and way more convenient. 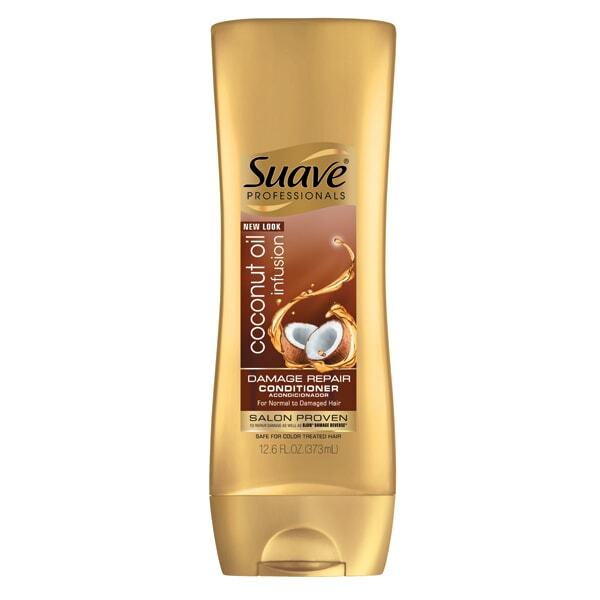 One of our favorite coconut oil infused conditioners is the Suave Professionals Coconut Oil Infusion Damage Repair Conditioner. Designed for those with damaged hair, this coconut oil conditioner won’t fix the damage done to your hair but it can help with prevention. When added to a formula that is designed to repair damaged hair, coconut oil works to help condition and moisturize the hair as damaged hair. This is especially helpful since damaged hair tends to be on the drier side. There are many options to choose from when it comes to this. One way is to deep condition with coconut oil. You can use the coconut oil by itself or opt for combining it with one of your favorite conditioners. In other words: You can make your own coconut oil infused conditioners right at home. All you have to do is heat up half a cup of coconut oil (the oil is solid when cool), then pour it into your conditioner and mix it together. Apply it to your hair after shampooing for five to 10 minutes, then rinse it out completely. If needed, follow up with a shampoo again to remove the oil residue before drying and styling your hair. If you have hair that’s naturally dry, you can opt for rinsing the conditioner out and moving on to drying your hair. Create an at-home conditioning treatment with coconut oil to condition your hair. Another way to use coconut oil to condition your hair is to use it as a daily (or every other day) hair conditioner. Looking for more? If you ever run out of leave-in conditioner, grab some coconut oil and dab it into your hair. One caveat: Coconut oil can be quite greasy. When applying it to your hair, simply add small amount to your hands, rub together then apply throughout your strands. If you go a little overboard, don’t worry a little dry shampoo can solve your problem in no time! Want to learn more about oils? Here’s why we’re loving argan oil for hair. Co-Wash Conditioners: How Do They Work? Get The Look: Soft and Piece-y Gala-Inspired Look from John D.